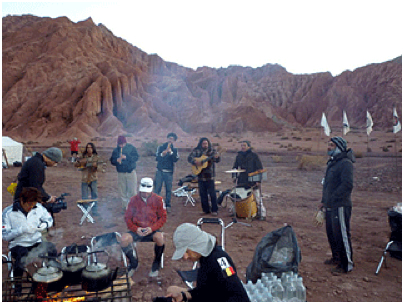 The Atacama Crossing 2010 was a 6 stage, 250 km long race on an altitude between 1600 and 3300 meters above sea level. Competitors had to carry their own equipment and food for the whole race. (at least 2000 calories per day). Only water , a place in a tent each night and, if needed medical support was provided. Although I had traveled long distances with heavy backpacks before, I never ran a marathon, not even shorter distance races. 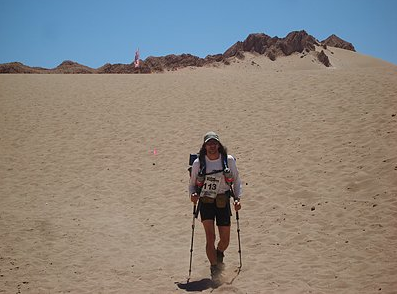 The other competitors were no ‘competition’ but a fountain of inspiration for my personal quest: finishing save and sound this emblematic Atacama desert ultra-race. The Atacama Desert stretches 960 kilometers south from the border of Peru and its average width is less than 160 kilometers wide between the Pacific Ocean and the Andes Mountains. It is basically a rainless plateau that is made up of salt lakes, lava flows and sand. It is noted to be the driest place on earth, with some places where no human has ever recorded a single drop of rain and with dry river beds that have not seen water in 120,000 years. The land offers up relics and artifacts today, evidence of man’s inhabitation of the desert for thousands of years. Some of the oldest mummies on earth have been found in the Atacama, one over 9000 years old. Huge geoglyphic paintings adorn the hillsides and ruins of Indian fortresses and sacred Inca sites dot the landscape. 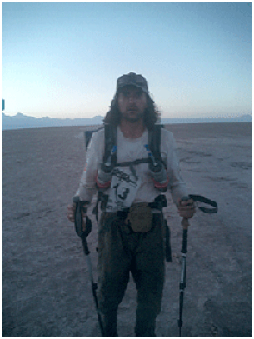 During the 6 day long crossing of the driest desert on earth, competitors kept asking me “how do you feel?” It sounded like a rather strange question to me. I couldn’t really answer it. I hadn’t crossed the driest desert before so I didn’t know how I should feel really. “What’s gonna be your strategy the following days?” was another frequently asked question. All I could possibly answer was: “Should I really have a strategy other than just ‘keep going’? Of course I was tired, hot, sleep deprived, thirsty, and most of all, always questioning what would be around the corner. But I felt alive and maybe even more alive than ever. As I said before, injuries had turned my preparation for this into a nightmare. But guess what? The constant hacking of my feet and blisters on that 250K was so dominant that not once did I ever feel any pain whatsoever in my actual knee injuries. I even believe that the long and intense, but well-paced crossing had been a healing process in itself. Every single person who had to drop out of the race was like a knife going straight into my heart. I could perfectly imagine how hard they had been training and preparing for this challenge over the last six months. It reminded me that we were all exposed to extreme factors which could stop us in the blink of an eye. On the trail, any form of living presence was an oasis of energy in the midst of a hostile environment. A dog running by, the 4 deserts cameraman, a photographer, the medical staff, or the many volunteers at the check points. They were all able to boost your morale within seconds. Thanks to all of them. Is taking part in a Crossing dangerous? It sure is! There is the danger of getting infected by a “virus” that will never ever leave your body again. Feeling small and vulnerable, feeling thankful for your drinking bottles to be refilled again, feeling thankful to find a chair at the campsite, feeling happy with that one more raisin in your expedition food pack. Those are feelings you probably will be chasing over and over again. During the six months of preparation we raised money for the ZEEPREVENTORIUM at De Haan. THE TOTAL AMOUNT OF MONEY RAISED IS 3833,15 € !! 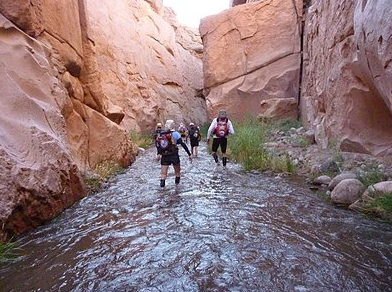 But “Atacama Crossing 2010” was much much more than just another fundraising project. I trained together with some patients and we had contact on a regular bases. They inspired me a lot and I hope I did the same for them. I want to say thank you to so many people, but in the first place to all who made a donation to the ZEEPREVENTORIUM. After the terrible earthquake in Chile on February the 27th, Zeepreventorium and I decided to start from that moment on, raising money for the victims of this disaster. Also the Chilean community in Leuven started a “Tsunami of Solidarity”.